Hosting the Nursery was a big incentive to get a few things done around the house - there is nothing like opening your home to a handful of strangers to make you want to feel a bit house proud (I'm sure Hugh would say this was a big incentive for hosting... I always like to give myself a deadline). 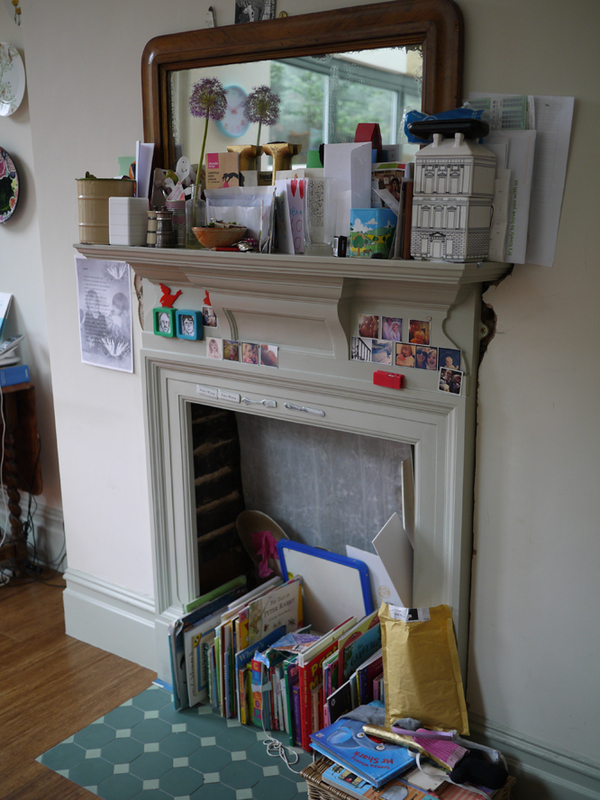 One of the areas of the kitchen that was still unfinished was the fireplace area - under the mantlepiece that I love to clutter up. It was under dispute between me and Hugh for a while. 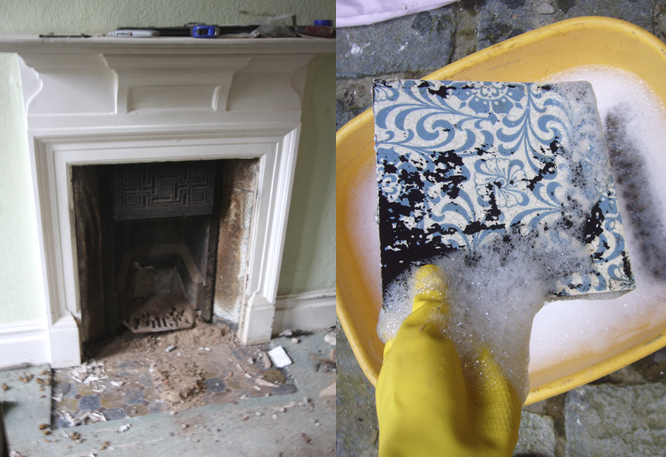 I was quite keen to try to re-install the fireplace inner (which was pretty badly degraded) and find new tiles for it - Hugh on the other hand won out with his plan to put some shelves in the space (and I think he might have had the right idea). 2009 - this was the fireplace in the kitchen - back in the days of bad photography; am ashamed that this is the best illustrative photo that I could find. The tiles in the surround which are hardly visible on the left, we cleaned up and used in our sitting room fireplace - the hearth tiles were in a really bad state so we got new tiles, same pattern but different colours. The mantlepiece, which is all cast iron (hence why it has all the stickygrams and magnets on it all the time) was striped and repainted by Hugh. So for a long time the fireplace looked like this, cluttered mantle piece with a void underneath. 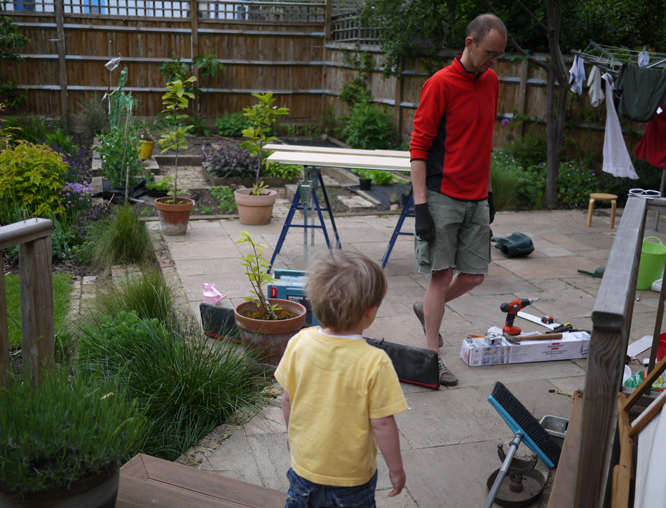 But then, du-dun-duuuuun... the tools come out... (Henry was disappointed to be kept at arms length from the action) and Hugh built a lovely free standing unit out of various bits of mdf that we had stashed away just for this very kind of project. 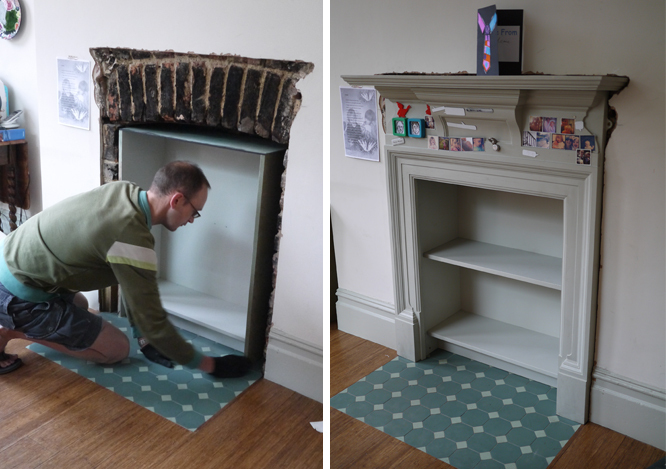 Hugh fitting his box (which if we ever do change our mind about will be easy to take out again)... and with the shelves and mantlepiece in place. 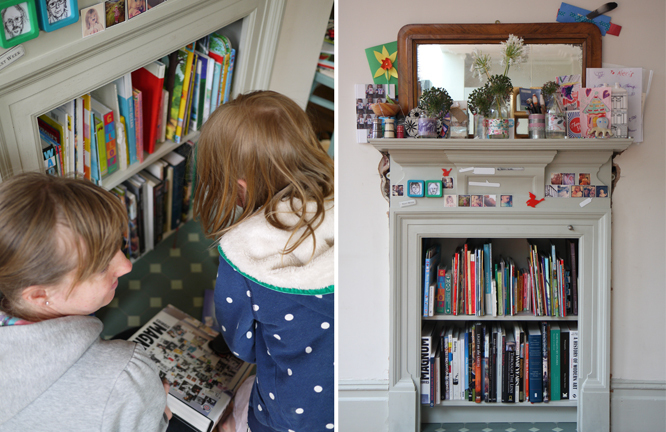 Me and Coco choosing books to go on the shelves - childrens ones on the top and adult ones below. We've put lots of our hardly ever looked at coffee table books there so that we might actually take them out and browse through them one of these days. 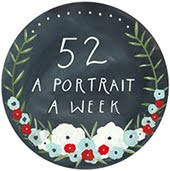 Naturally we don't want to ever FULLY finish a job (or what would we have to aspire to...?) 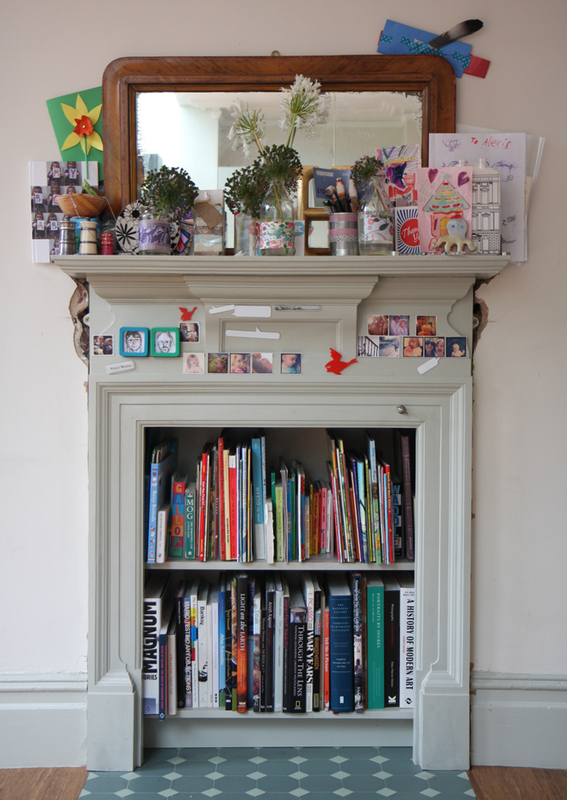 so the final filling and painting around the mantlepiece is still on the never ending to-do list. But a big improvement... and another step closer to this house project being done. A great use of space. We too have a shelf in our dining room fireplace void which is useful, but unfortunately we didn't think of Hugh's great box idea, so debris from the chimney does rain down on the books. Perhaps we should do a similar thing ourselves or at least block off the chimney more successfully. We are thinking of putting in a wood burning stove at some point though so it probably isn't worth doing too much with it. Maybe a pillow will suffice for now.